We listened with rapt attention as the Founder of Da Planners shared his dream of starting a travel agency with us, and we knew that we needed to work with him to birth something much more than a travel agency. He trusted our expertise and leadership as we went ahead working together to nurture the idea and design a brand roadmap for it. 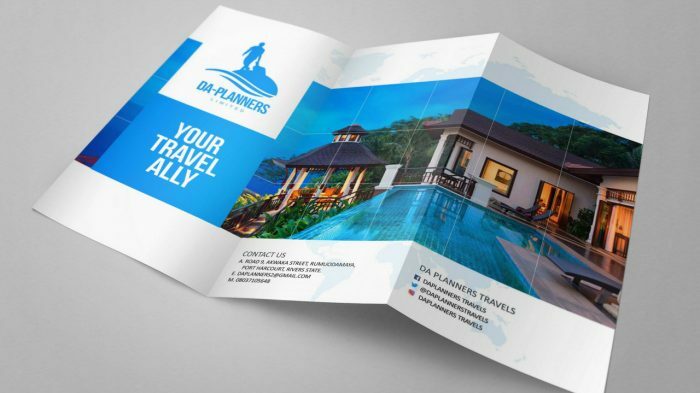 Our work spanned across the brand roadmap, logo and visual identity design, brand strategy, social media set-up, communication designs, profile content development and business structure. Everything culminated into the birth of a travel ally, and not just a ticketing shop which is what most agents do.